That's a quote from a historic French writer, Francois De La Rochefoucauld, who I must admit I had never heard of until I started doing a little research about the wisdom of the fool, for April Fool's Day. The Fool is a universal archetype. He is a little voice inside us that observes and comments on our lives as we journey through the human experience, pointing out what we sometimes refuse to acknowledge. He helps us recognise our own folly, and learn from our mistakes with humour, but also points out that it is necessary to take a risk and go out on a limb from time to time, even if there is a chance we will land on our bottoms and make an idiot of ourselves. That's OK, the Fool says. Laugh at the joke, pick yourself up, and have another go. With that idea in mind, and timed to launch on April Fool's Day, The Fool's Wisdom Oracle Cards are a new divination set by Sonia Choquette, author of Trust Your Vibes: Secrets For Intuitive Living and Diary Of A Psychic: Shattering the Myths. 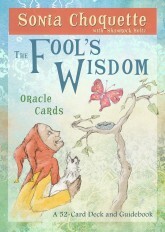 I haven't got a copy of The Fool's Wisdom to review yet, but the deck is definitely on my wish list. Publisher Hay House says on its website: "The Fool's Wisdom Oracle Cards are designed to accelerate personal empowerment and spiritual growth. You can seek the Fool's wisdom on any subject at any time. Use these oracle cards to attain personal growth; deeper insights; and clarity into any situation, relationship, decision, interaction, or question you may have." That, I think, is great advice for April Fool's Day or pretty much any time.